Lose That Girl: RATE IT! EPL Countdown ~ 20 Days to Go! 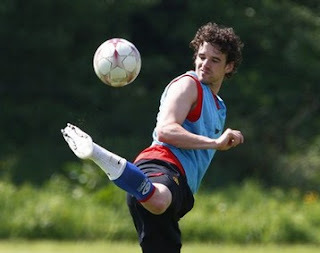 Just like Owen Hargreaves (pictured, right), we're kicking up our heels in anticipation of the launch of the next English Premiership season -- only 20 days to go!! Hooray! The return of Owen and Ryan! The return of the entire club! The return of regular thigh sightings! Glad I'm not the only United Kickette with a countdown going.